The coaches have spoken, and the Frontier Conference was allowed just one team in the postseason for the second year in a row. Never mind that Frontier Conference teams have won more road playoff games than any other conference in the past five years. Never mind that Frontier Conference teams who played non-Frontier Conference opponents won easily this year (Montana Northern won its only game when it played outside the conference, Rocky Mountain beat Dickinson State–yet Rocky enters the postseason as a lower seed than Dickinson, and Carroll College beat Linfield College who is 7-1 when not playing Frontier Conference teams). Massey has the Raiders as #10 in the country, but that’s not good enough for the postseason. 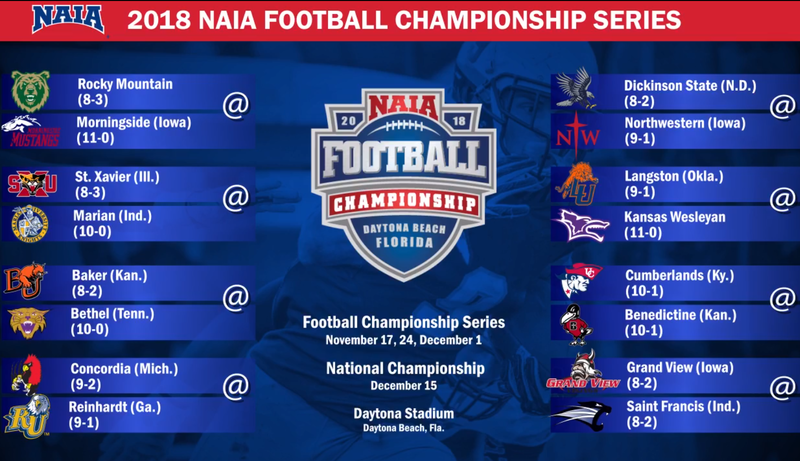 Instead, teams like Kansas Wesleyan, who Massey has as #20, will be hosting a home playoff game. Neither Langston or Grand View are in Massey’s top 20, and Dickinson State isn’t even in Massey’s top 25. Massey has Rocky as 10-point underdogs at Morningside. Who gets in as an at-large is not really up to any committee. It’s based entirely on the NAIA coaches top 25 poll. The automatic bids go to any conference champion that is also ranked in the top 20. After those are determined, they select the highest-ranked teams not automatically selected until all the at-large selections are filled. The 5 at-larges this year were ## Northwestern, #8 St. Francis, #10 Grandview, #11 Cumberlands, and #13 Concordia. It’s no slight to the Frontier Conference. It’s just the way it is. I know it’s the way it is. I’ve been arguing for years that the way it is isn’t good. Some sort of impartial ranking system (like Massey) should be used instead–one that rewards better teams and teams capable of beating good teams, not teams that can only win in weak conferences.